As NASA’s Dawn mission continues to circle dwarf planet Ceres, we’re getting better and more detailed images of the planet’s mysterious bright spots. And yet, science is no closer to understanding what’s making this far-off planet glow. Dawn’s imaging passes have also revealed small mountains on the planet’s surface, nestled among Ceres’ many craters, rising about 3 miles high. In a few weeks, Dawn will move into a lower orbit around 900 miles, arriving sometime in early August. 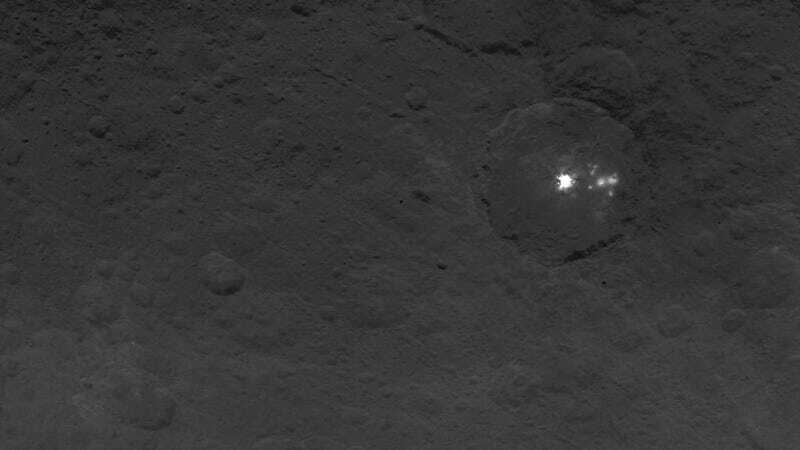 Hopefully, that should give us a better idea of what’s causing the bright spots on Ceres, and we can start taking appropriate steps to arm humanity.